I met my best friend online, I met my boyfriend online, and I met Courtney, blogger behind Journey to Courtney, online. 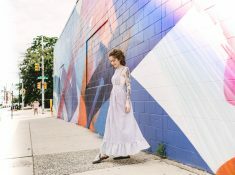 Our online paths first crossed when she modeled for Expect Lace, a Philadelphia lingerie boutique that carries Madalynne. Who is this girl – I want to know more! One, two, three clicks later and I was lurking her IG like an ex. She’s 28-year-old Philadelphian, full time writer, part time ranter, chronic shopper, coffee connoisseur and lover of all things lifestyle. She’s also undergone vertical sleeve gastrectomy (VSG) procedure, losing over 100lbs since December 2015. By losing weight, she’s also gained a lot of knowledge about herself and she’s very honest about it on social, which I so appreciate in today’s filtered world. Shop all Madalynne custom lingerie. I’m not sure why more shops don’t do bralettes and wireless bras for fuller busts. Having a heavier bust can be very uncomfortable, so you’d think manufactures would want a bra that takes this into consideration, but it seems as your bra size goes up, the comfort level of your bra has to go down. This bralette just goes to show it doesn’t need to be this way! what size would i choose in this model bra if of your lines if i were 37.5 on the fullest and 30 around the underbust?